Finally today was our Fat Tire Bike Tour! Ive heard CEO David Mebane speak several times so I was really looking forward to this. Biking through the streets of Paris was a lot of fun and way less crowded than busy London. We biked to several major monuments and historical buildings but it was difficult to remember the names because some were longer French names. I learned a lot about the history of Paris and I loved looking at all the cute little town homes. After having two bike tours these past two weeks we were all dominating pros at this point. My favorite of course was visiting the Eiffel Tower. All of the girls had a huge photos shoot and it was awesome! This was definitely on my to-do list here in Paris. For lunch our tour guide took us to a cafe in the park. The service was not the best but the food was great. A cheese and salad bread plate was what I ordered, with of course,Ice cream to finish it off. I have found that France definitely knows their sweets because all of them are amazing! 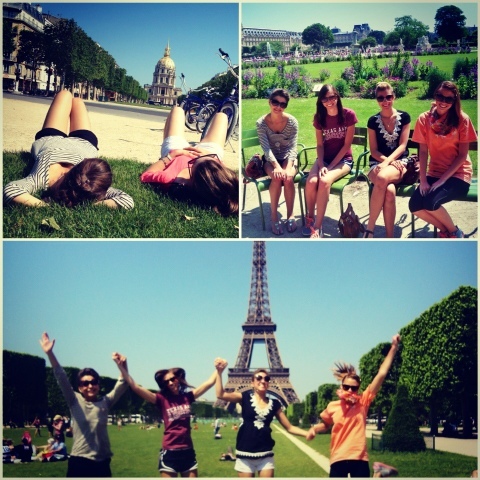 When weF finished up the tour my group ran home and changed for shopping in Paris. We went to Galleries Lafayette to find a few Parisian souvenirs. The store had beautiful architecture and seemed to have more of a mall type setting. However it was hot, crowded, and I had to hunt for good prices. I was lucky and found a cute swimsuit, a pj set for my sister Catherine, the perfect little purse, and a jacket. The shopping here is fantastic and I had to contain myself for fear of spending all my Euros. We were starving and ate pizza nearby at a place called Pizza Pina... It was so good, you could tell it was all made from scratch. The boat cruise was scheduled for the evening and we had the best views of the city. Notre Dame and the Eiffel Tower were beautiful up close and I got some great shots of the buildings lit up. It was a great way to relax and sit down from all the busyness from the day. Dressing up and drifting through the river across Paris was absolutely perfect. After the cruise a few of us went back to Aaint Michel for some gelato. The shop served it on a cone in a shape of a flower with as many different flavors as you want. It was go good I got Nutella and vanilla with dark chocolate chunks on my cone. All of us talked about school, life, and really took time to get to know each other. We all were really enjoying our last few nights in Paris. Ice cream, good friends, and the city of lights..what more could a anyone ever want?